Could I be any more excited about The Muppets coming back to theaters? No, probably not. I LOVE them. I LOVE Jim Hensen. 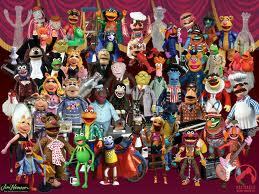 And I am thrilled that The Muppets will grace us with their hilarious and magical presence once again. This entry was posted on November 12, 2011 by Laney. It was filed under Blogging, Fall, Random, Writing and was tagged with Jim Henson, Muppet. My little sister (now well into her thirties) has always loved them too, I have to admit a new found appreciation of them myself.